Winner European Wrap Star SII (left to right): Frank Jänschke, Head of Sales WFP, Seiko Instruments GmbH Winner Carl Felix Maas, Folien Center-NRW GmbH Stephanie Rohn, Product Manager WFP, Seiko Instruments GmbH Frank Kühn, Managing Director, Seiko Instruments GmbHDuring the course of the Viscom exhibition which was held in Düsseldorf at the beginning of November, the 5th European Wrap Star competition took place to find the European Car Wrappers champion. Over three days and five rounds, a VW up! had to be laminated, with quality, not speed being the main criteria for the jury of experts. 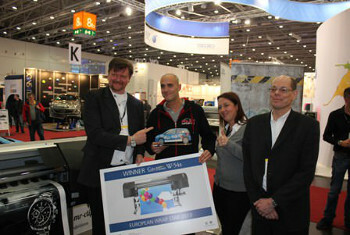 The winner finally selected was the German Carl Felix Maas of the company Folien Center-NRW GmbH in Haan. Along with the obvious fame and glory he won as the main prize a Seiko Instruments’ 6-color ColorPainter W-54s with a value of more than €15,000. Seiko Instruments GmbH had committed itself as the main sponsor of this well-established competition as the company maintains that its digital wide format printers have the essential technology for the very ambitious prints required for car wrapping. It added that the ColorPainter W-series printers with their mild solvent GX- ink provide excellent colour gamut and high colour brilliance, while at the same time have all the outstanding characteristics concerning adhesive strength, drying and stable outdoor durability that are highly recommended for car wrapping. The company said the W-series has accurate colour fidelity which allows advanced tiling jobs for fully and partly film coverage of vehicles, and that this great visual impact was seen on Avery foil which was provided for the complete competition.